Dean Gonsalves punched the shark which attacked his wife. THE IRISH MOTHER of a man who saved his wife by punching a shark has hailed his heroic actions. Anne O’Donoghue’s son Dean Gonsalves was swimming with his wife Frankie off the coast of Ascension Island in the South Atlantic on Friday when the shark attacked. Frankie suffered a severe injury to her Achilles but a more serious outcome was avoided when Dean repeatedly punched the shark, forcing it to flee. He would do anything for her. He is very strong and very kind. I couldn’t ask for a better son. He is a hero but I was proud of him before he did this. The story has attracted interest across the world, being covered from Australia to the US, as well as extensively in Britain. “The person concerned was swimming near the shore and her injuries were attended to at the George Town Hospital. 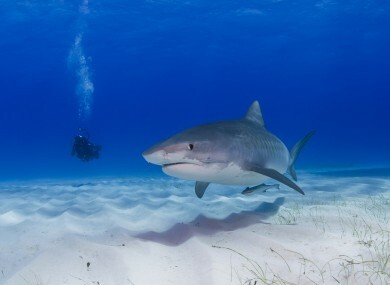 Sharks are a common feature in the water around the British oversea territory, where swimmers are told that they are in the water at their own risk. Email “Irish mother hails 'hero' son who punched shark that attacked his wife”. Feedback on “Irish mother hails 'hero' son who punched shark that attacked his wife”.